The Great Northern Railway ordered fifteen 4-8-2s from the Lima Locomotive Works and took delivery of these Class P-1 "Mountains", road numbers 1750 through 1764, in 1914. These locomotives had 28 x 32 cylinders, 63" drivers, a 180 psi boiler pressure and a tractive effort of 60,930 pounds. They were bought to speed up passenger trains over the mountains. When they proved to be too slow they were transferred to freight. 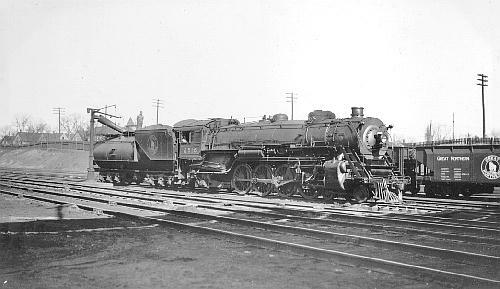 In 1928, the fifteen Class P-1s were rebuilt and returned to service as 2-10-2s. 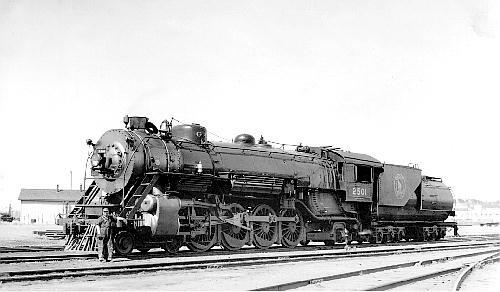 In 1923, the GN received 28 Class P-2 "Mountains" from the Baldwin Locomotive Works. These locomotives were assigned road numbers 2500 through 2527 and had 29 x 28 cylinders, 73" drivers, a 200 psi boiler pressure, a tractive effort of 54,823 lbs and weighed 365,600 pounds each. Later, the boiler pressure was raised to 210 psi which increased the tractive effort to 57,580 pounds. The Class P-2 "Mountains" did an excellent job in passenger service. They were eventually replaced by the S-2 Northerns in Empire Builder service. The P-2 class locomotives were then used in freight service and were retired in 1955. There are two survivors, number 2507 in Port of Pasco, WA and number 2523 at the Kandiyohi County Historical Park in Willmar, MN. Data from GN 1916 Locomotive Diagrams supplied in August 2013 by Allen Stanley from his extensive Rail Data Exchange and "Passenger Locomotives for the Great Northern," Railway Age Gazette, Vol 57, No 23 (14 December 1914), pp. 1049-1050. Works numbers were 1364-1376 in June 1914, 1377-1378 in July 1914. Designed with a conical Belpaire boiler and relatively huge 16" (406 mm) piston valves. The first ten burned coal, the last five used oil fuel. These Mountains ran the hilly sections of the Great Northern's route, including a section between Cut Bank and Whitefish, Montana that had 1.8% eastbound grades. According to Railway Age, introducing the Mountains had eliminated the need for a helper engine and had increased speeds to 20 mph (32 kph). This wheel arrangement was so new to railroading that Lima' was able to compete with the Baldwins and Alcos. It's clear from the details that the Ohio builder, like its larger competitors, still thought of the 4-8-2 as a bigger, higher-driver form of the Mikado whose four-wheel front truck better suited it for passenger work. Note the low factor of adhesion even at 180 psi. Also note that while the superheater area is given as 1,075 sq ft (99.87 sq m) in the 1914 RAG article, the GN listed the figure as 975 sq ft at least as early as its 1916 diagram book. That speed and the 15 mph (24 kph) over the Cascades' 2.2% grade proved too slow for passenger service, however, and the 4-8-2s were put into freight service. In 1928 they became Q-2 2-10-2 freight hogs, the only time, George Drury (1993) noted, that a Mountain was converted to another wheel arrangement; see Locobase 8114. Data from DeGolyer, Vol 67, pp. 295+ and GN locomotive diagram found on Ben Ringnalda's  (viewed 18 August 2003). (My thanks to Chris Hohl, whose query about apparent discepancies among sources led me to expand this entry and for his 8 August 2016 email noting the original boiler pressure and the coal tenders in the last ten locomotives.) Works numbers were (in order of delivery) 57000-57002, 57084-57085, 57182-57190 in September 1923; 57256-57258, 57339, 57012, 57253, 57341-57347 in October. (18 August 2003) presents the Great Northern Railway Historical Society's Reference Sheet No. 217 (June 1994), which notes that the P-2s were designed to meet the demand of the Great Northern's Oriental Limited. Piston valves were smaller than those of the earlier P-1s, measuring 14"(356 mm) in diameter. Everything else about these engines -- grate, boiler, superheat ratio, adhesion weight, firetube diameter -- grew in response to the demand. The specifications show the locomotive as delivered in 1923. The firebox heating surface included 40 sq ft (3.7 sq m) of arch tubes and 95 sq ft (8.8 sq m) in the combustion chamber.. As delivered, the allowable pressure was 210 psi, but the working pressure was set to 200 psi. Fourteen-inch (356 mm) piston valves served the over-square cylinders and Vanderbilt tenders trailed the engines. Chris Hohl notes that the last ten were delivered as coal burners (see the Baldwin specs beginning at p. 318) and thus trailed tenders loaded with 20 tons of coal (18.2 tonnes). The engines came with a different firebox layout that deleted the arch tubes in favor of 89 sq ft (8.25 sq m) of thermic syphons, which raised the direct heating surface area to 447 sq ft (44.3 sq m) and evaporative heating surface to 5,018 sq ft (466.2 sq m). When they went into service, P-2's initially were limited to a 50-mph (80.5 kph) top speed, but still managed 4,800 miles (7,728 km)/month with single crews. The coal burners handled the Oriental east of Cut Bank, Montana. The other eighteen oil burners operated farther west. Tonnage rating was 10-12 heavyweight passenger cars up Walton Hill (1.8% ruling grade) at 18 mph (29 kph). The center syphon was later replaced with arch tubes in all of these locomotives except for 2525, which had the syphons removed altogether. Also, the last ten were converted to oil burning. Later diagrams would show the tube count reduced to 217 and a commensurate drop in evaporative heating surface area to 4,850 sq ft (450.75 sq m). Adhesion weight had climbed to 265,600 lb (120,429 kg)) and engine weight increased to 388,700 lb (176,312 kg). A later increase in pressure to 210 psi raised the starting tractive effort to 57,580 lb (26,118 kg). The later tenders featured an increase in oil capacity by 800 US gallons to 5,800 (21,953 litres) in all locomotives. Eleven retained the 12,000-gallon water capacity and weighed 251,400 lb (114,033 kg): 2509, 2513, 2515-2516, 2519-2520, 2522, 2524-2527. The other seventeen--2500-2508, 2510-2512, 2514, 2517-2518, 2521, 2523-- increased water capacity to 15,000 US gallons (56,775 litres). The longer tender increased the engine-and-tender wheelbase to over 90 feet (27.45 metres) and weighed 305,950 lb (138,777 kg), bringing the power system's weight to 662,950 lb (300,709 kg). Drury (1993) comments that these were successful passenger-haulers and were considered by many to have the best-looking Great Northern engine class. He adds (195) "Their over-square cylinders were unusual; yet more unusual for Great Northern was the conventional radial-stay fireboxes [as opposed to Belpaire]."